If you own cattle, you pay a mandatory levy each time you sell an animal. This levy is a combination of national and provincial check-offs. The collection and remittance of the levies in Canada vary by province and are an integral part of a sustainable and profitable industry. The term “Canadian Beef Cattle Check-Off”, often called the national check-off, is used to describe the portion of the money that is invested in national beef cattle research, market development and promotion. The provincial check-off is the portion used by the provincial cattle associations to carry out their mandate, which includes provincial advocacy, policy and trade initiatives. 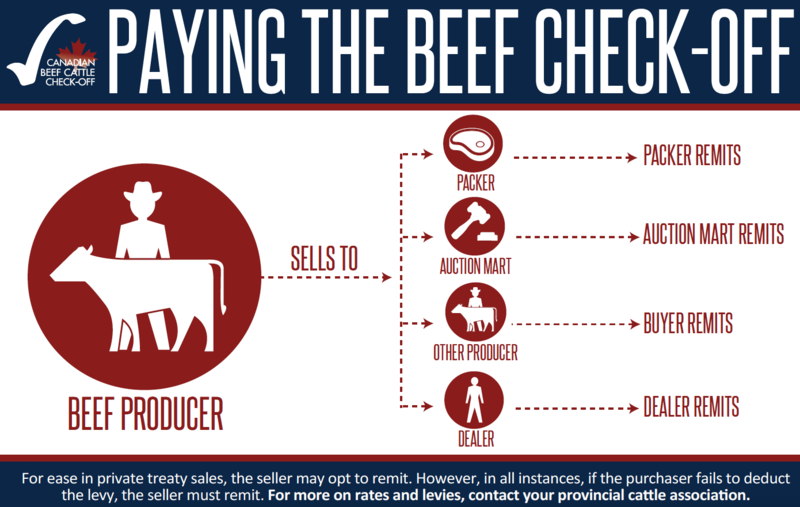 When cattle are sold in Canada, either the provincial levy or the federal levy is collected, not both, depending if the cattle are sold within the province, or across provincial borders. In Manitoba and in each province east of Manitoba, the amount of the federal levy is the same as the provincial levy where the seller of the beef cattle resides. In Saskatchewan, Alberta and British Columbia, the amount of the federal levy is the same as the provincial levy where the beef cattle are sold. When a producer sells beef cattle in their home province, that producer pays the provincial levy to their provincial cattle association. Of that provincial levy, a portion (the Canadian Beef Cattle Check-Off) is paid to the Agency. The balance of the provincial levy is retained by the provincial cattle association. A producer from Maple Creek, SK sells steers at their local auction market. The auction market collects and remits $4.50 per head on the sale to the Saskatchewan Cattlemen’s Association (SCA). Of this $4.50 provincial levy, $2.50 is designated to the Canadian Beef Cattle Check-Off, and the balance remains with SCA as provincial check-off. A producer from Olds, AB privately sells bred heifers to another producer near Nanton, AB. The buyer from Nanton deducts the $4.50 per head from the funds payable to the seller from Olds and remits it to the Alberta Beef Producers (ABP). Of this $4.50 provincial levy, $2.50 is designated to the Canadian Beef Cattle Check-Off, and the balance remains with ABP as provincial check-off. When a producer sells beef cattle outside their home province (inter-provincial trade), that producer pays the federal levy. The provincial cattle association collecting the federal levy pays the federal levy to the Agency. The Agency keeps the Canadian Beef Cattle Check-Off and pays the balance to the provincial cattle association where the producer selling the cattle resides. A producer from Fredericton, NB sells cull cows at an auction market in Ontario. The Ontario auction market collects and remits $6 per head on the sale to the Beef Farmers of Ontario (BFO). Of this $6 federal levy, $2.50 is designated to the Canadian Beef Cattle Check-Off, and the remaining $3.50 is allocated back to the New Brunswick Cattle Producers as provincial check-off. Those who have questions about the calculation or remittance of levies on cattle traded should contact their provincial cattle association.